As I stare out on these cold castle walls, awaiting the inevitable attack by the baying hordes below, my mercurial mind wanders down dark paths, causing me to look back over the last few months and wonder what has become of me, and more importantly, who I have become. Shallan, lady of Morwella. Simple. A name and a title – what more could one want in this life? happiness, you say. Fulfilment… I know little of those fleeting birds, mine has been a sombre existence. Duty and honor. I was a vase on a pedestal, watched from a distance, observed and admired, but none dare venture too close. Well, one did once but that was a different story. For years minstrels in Vangaris sang of my pale beauty and grace. How I glided instead of walked, and how my hard-won smile could launch a host of noble lords, each one eager to win my chaste and guarded charms. Utter nonsense – (or total crap, as my coarse new friend Barin would say). But such was my life back then as a high-born lady and coveted daughter of the stern Duke in Morwella, most northerly of the Four Kingdoms of this world men call Ansu. Mother died young, there were rumors of complications. Just how complicated I have only recently discovered. Secrets unravel over time. Like an oily worm rising for rain, truth will out. She passed one dreary winter night and Father mourned and moped and said nothing of the matter. Even as a girl I could see the guilt and torment twisting his face. Now I know the truth I forgive him entirely – not that that’s much comfort to the duke as he awaits me in the dark silent halls beyond. I guess I first realised I was different when the dreams fell upon me. Oh, I know Queen Ariane has the Royal Dreaming (more on her in a minute – ugh). My dreams were different, though they followed the same pattern each night. A deep dark wood, myself walking with feet bare and silent… the stranger watching me beneath the trees. The Horned Man – he of the sad eyes and silent lonely smile. I know his name now. Back then he was just another mystery in this troubled maiden’s head. Love? I cared little for that. How things change. But I was so cold then. Distant. people read me wrong, and I can understand why Ariane so disliked me (though I’m disappointed that she still holds a grudge. Silly that, after all we’ve been through). But she’s a queen with a kingdom to rule. A fragile one too. I hear that the tyrant Caswallon has his eyes on her country (and her royal person – if rumours be true). King Nogel had small time for that conniver. Ariane? she hates Caswallon, sure, but lacks her father’s skills. She’s young, rash. Feisty and bitchy – a hell-cat. Always has been. Ariane thinks like an arrow, whereas I see curves in every road. It’s why we two have never been friends. I gaze down, brush my fingers against the great horn hanging from the belt at my waist. 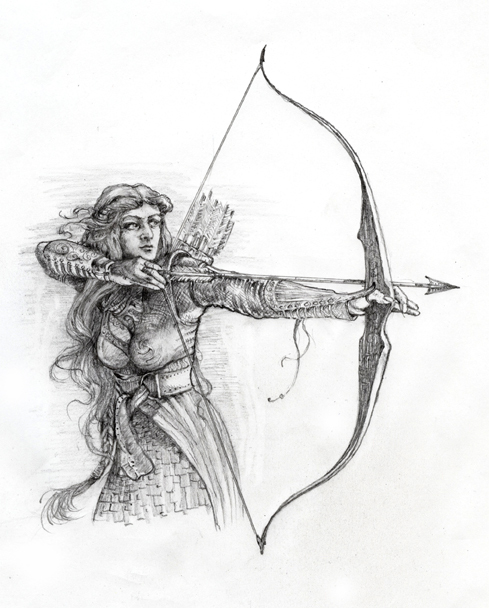 A comfort to me, as is my bow and new-found skill at archery. ‘You are Faen, Shallan,’ they said that day. ‘One of us.’ The faerie folk told me and I now know they were right. I am different. Though I feign serenity inside a gale musters. I AM WARRIOR! So reader please bear with me. Mine is a troubled road. I lack Corin’s wry wit, and Barin’s gruff crude humor. Nor do I own to Ariane’s valiant optimism, for I see the world in many shades of grey, she in simple black and white. The next character blog takes us up and up way beyond the clouds, where the zany trickster, Oroonin tells us what he chooses about His plans for our universe while His Father, the BIG BOSS is away fashioning new worlds out of chaos. Next week it’s me again. J.W.W.